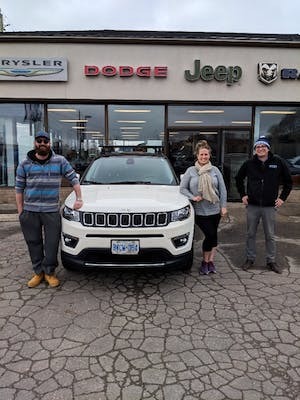 While you may have known us as 'Waterloo Dodge' for a time, we are happy to be joining the Finch Auto Group family of dealerships and giving ourselves a quick coat of paint while we are at it. 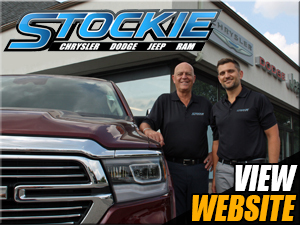 One re-brand later, and we are now open and ready to continue serving you better than ever as Stockie Chrysler Dodge Jeep Ram. We still have all the same great service, low-pressure sales team, and customer-first policies that we have always had at Waterloo Dodge, but now we have the selection and peace of mind that comes with the Finch Auto Group name. We were good apart, but together we might just be the best dealership in all of Ontario. Very knowledge staff, welcoming and made the process incredibly easy and swift. Thank you Tyrone for going over all the bells and whistles of our new family vehicle, I have never had an experience where my sales associate goes through the car and demonstrates/explains the way he did! We will recommend to our friends! Thank you so much, Dave! Our team works hard to make sure service is completed promptly for all of our amazing customers, and we're pleased that that has been the case whenever you bring in your truck! We will continue to strive to do our best for you! "New key, delivered to me!" Thank you so much for sharing your experience! Our team strives to go above and beyond for all of our customers and we're so pleased that it reflected on your experience with Ryan! If there's anything else you need, please don't hesitate to reach out! "New 2019 Dodge Grand Caravan"
My best car buying experience so far! The staff is very courteous and friendly, knowledgeable and helpful. Tyrone Bond was simply outstanding in guiding me to my new car purchase, spending time to ask questions to understand what is important to me and matching possible options to what I need. Dean Prather offered me excellent financing experience. 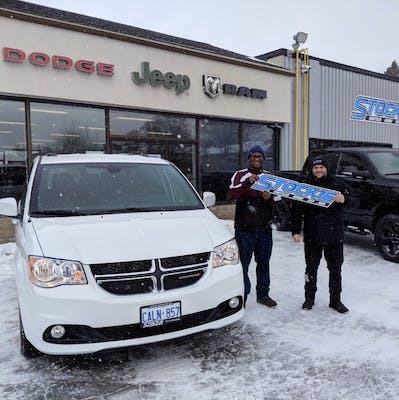 I have been driving my new 2019 Dodge Grand Caravan a month now and I simply love it and I am happy that I purchased my new car at Stockie Chrysler Dodge Jeep Ram. Hi there! Thank you so much for sharing this amazing feedback! We're so pleased Tyrone and Dean made sure that your experience goes smoothly and we're happy that you're loving your new Caravan! If there's anything else we can help you with in the future, please let us know! "New 2019 Doge Ram Purchase"
I decided to purchase a new Truck and Vlad at Stockie Dealership helped every step of the way. He helped me narrow down the truck the best suit my needs and made sure I was taken care of no matter what time of day it was. I ended up selling my old truck privately and Vlad helped coordinate that sale as well. Will definitely buy again from Stockie. Thank you for your kind review! Our team works hard to ensure our customers have all the information they need and have a great purchase/trade experience and we're happy it reflected on your visit! Enjoy your truck and we hope to see you back again! We love our new compass! Vlad was so very helpful each step of the way. This is our second vehicle bought from this location, and we would choose to come back here again and again. Hi Mandi! Thank you so much for sharing your experience! We truly appreciate your feedback and we're happy that Vlad helped make your experience awesome! We look forward to seeing you again in the future! I contacted Stockie Chrysler with regard to scheduling an overall check up and oil change, along with the removal of my winter tires. My appointment was booked quickly and for the date I had requested. Hi there! Thank you for sharing! We're glad to know your appointment was booked promptly and we hope our team made sure your vehicle is all ready for the new season! If we can ever help you with anything else, please let us know! Hi Jane! Thank you so much - we truly appreciate your recommendation! It's wonderful to hear that our team was able to do a fantastic job in helping you with your purchase! Enjoy it - and have fun on the Vegas trip!
" fantastic customer service ." 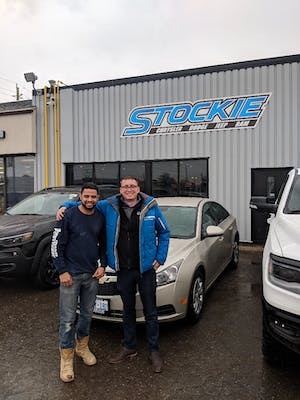 I want to say thanks to Vladimir for an awesome help and great service , love my car you guys are the best of best in Waterloo region highly recommend. Thank you again! Hi there! We're so happy Vlad was able to help you out with your car! We really appreciate your feedback and recommendation! Enjoy your car and if there is anything else that we can help you with, please don't hesitate to let us know! 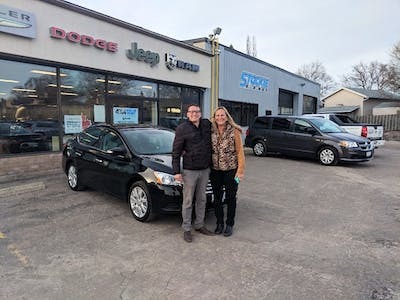 "Great repairing service at Stockie Chrysler"
My Jeep previously had leaking problems and Ryan handles all the problems and works for me. Very nice work done. I would also thank Vlad for picking me up. Hi there! We're so happy to hear that Ryan was able to handle all the problems with your Jeep! Enjoy it, and if we can help you with anything else in the future, please let us know!